Dust comes in different sizes. The dust you can see is annoying, but it is the tiny dust particles you can’t see that pose a bigger threat. Construction workers who are immersed in dust while sawing concrete or busting up rock are at risk of coating their lungs with fine dust and impairing their health. OSHA responded to this risk in late 2017 by issuing a “respirable crystalline silica” standard. It requires employers to limit exposure of workers to dust. Read more at osha.gov/silica. Some manufacturers of hydraulic hammer and breaker attachments have responded to the OSHA mandate by introducing dust suppression features with their units. 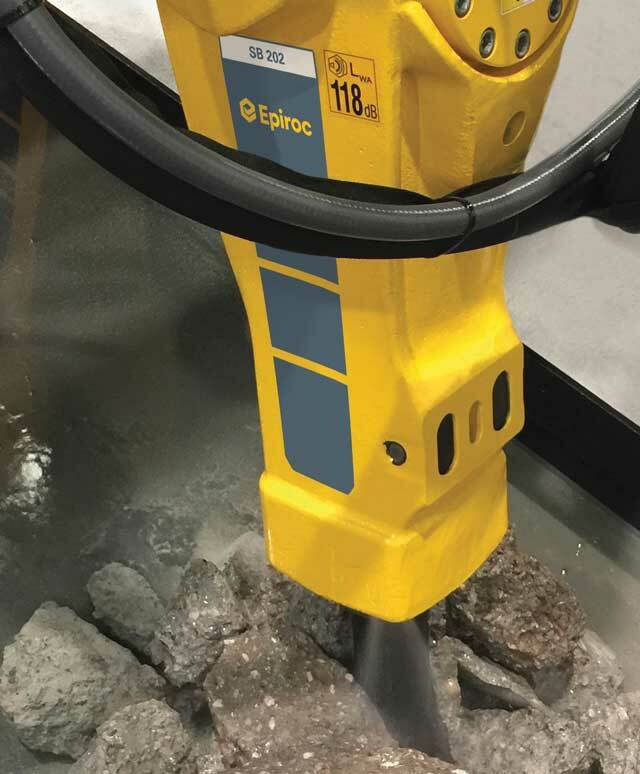 In the case of Epiroc (formerly part of Atlas Copco), the anti-dust feature came to the market before the OSHA standard. The company’s SB Series of breaker attachments has included dust suppressant engineering since 2005 when a redesign of the company’s breakers began to incorporate it. The anti-dust engineering was not heavily promoted after the initial introduction of SB breakers on this side of the Atlantic, Elliott says, “because most contractors showed little interest in the feature.” When subsequent models were introduced, the feature was mentioned without much elaboration. Not until OSHA took a public stand did Epiroc again highlight the value of its fully integrated system and contractors begin to appreciate it. All of the systems on SB Series Epiroc breakers are engineered for water pressure of 58 psi. A higher-pressurized stream doesn’t seem warranted. After all, the idea is to gently soak dust rising from splintered rock or concrete and settle it to the ground, not blast it apart. Elliott says 58 psi sprays up to 1.3 gal of water a minute in the SB152, which is suitable for a compact excavator or medium-sized skid steer. Some larger SB models utilize two-nozzle and sometimes four-nozzle systems, but water volume doesn’t increase proportionally. For example, four-nozzle breakers consume slightly less than 3 gal of water per minute, with the recommended psi remaining the same in all models. Over at NPK, a dust suppressant kit was introduced in 2018 in direct response to the new OSHA standard. “We decided to make the bracket on our PH1 through PH4 enclosed-style hammer water-ready,” says Kyle Bias, the company’s product engineer. The water-ready kit consists of a stainless-steel braided hose line, a clamp and inlet and outlet ports. The welded lower bracket on the hammer now has a hole drilled in it for the outlet fitting. “This means the integrated water channel is in every enclosed bracket going forward, whether or not a dealer or customer uses it. They can simply remove the inlet and outlet plugs, insert a fitting in the inlet and a nozzle in the outlet and connect a supply hose,” Bias says. Older PH1 to PH4 hammers can be retrofitted by drilling holes in the lower bracket and a front plate assembly and thread-tapping the inlet and outlet ports. NPK envisions lower water usage in its anti-dust system than Epiroc does in its system. While Bias doesn’t specify a recommended psi, an NPK dust suppression brochure suggests a 60-psi spray from a PH1 breaker will utilize just a quart of water per minute, presumably because the spray is finer. Not tackled by the two manufacturers is the matter of sourcing the water to be sprayed onto the working chisel point. A piece of compact equipment is not a perfect machine for carrying a large drum of water and a pump. And not every worksite is adjacent to a pond. A rumor in the industry is that some contractors in California have decided not to use the water spray units against silica dust because the EPA fine for contaminating a water source is greater than the OSHA silica dust fine. True or not, spraying dust is hardly standard operating procedure in breaker work. Why Don’t Excavators Use Dust Vacuums? Manufacturers have a different solution for dust raised by tools smaller than hydraulic hammer attachments, such as jackhammers and concrete saws. The dust produced by those tools often is vacuumed away. However, it is a whole other matter to similarly equip a hydraulic breaker on the working end of a compact excavator boom. For one thing, the volume of dust can be greater. For another, the working point for the chisel often is irregular — a boulder or chunk of scrap concrete — unlike the smooth surface of concrete pavement or a basement wall. Consequently, the interface of the vacuum collector and object being battered is more difficult. Greater vacuum pressure is required as well, which means the suction pump and collection container are likely to be bulky additions to an operating machine. All in all, vacuuming silica dust in demolition or quarry work is an unwieldy proposition. Not that watering down the dust is a perfect solution for heavy equipment. After all, the product of dust and water is mud. An unpaved working space can turn into a bog or at least become sloppy if enough hours are spent in one place shattering rock or concrete. A lot depends on the nature of the work site. Hermetically sealed cabs and laser-demolition techniques may eliminate the silica threat in construction workplaces in the future, but for now dust remains a problem for man and machine. 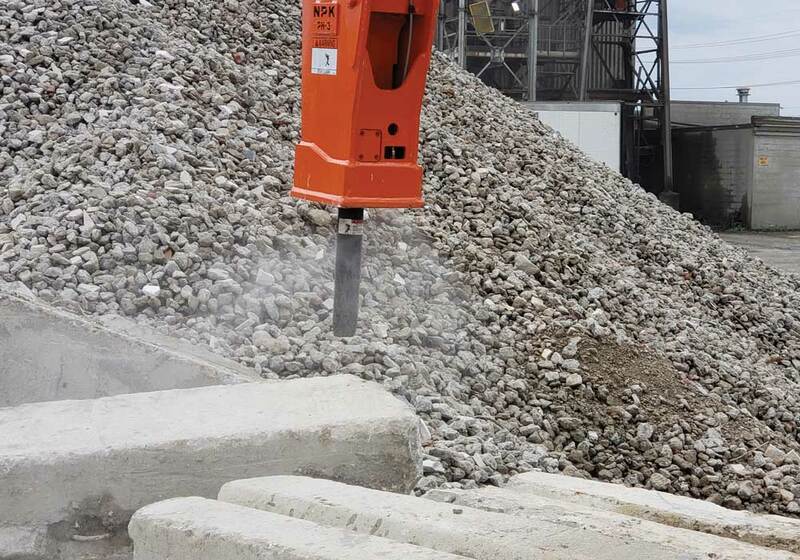 An optional dust collection system is available to meet crystalline silica standards. Minnich Mfg.’s A3/A6 machine-mounted drills maximize productivity and safety on patchwork jobs. Featuring up to six drills, these pneumatically powered units can be mounted to an excavator, backhoe or skid steer loader to form a self-contained and highly mobile drilling solution for full-depth repair. 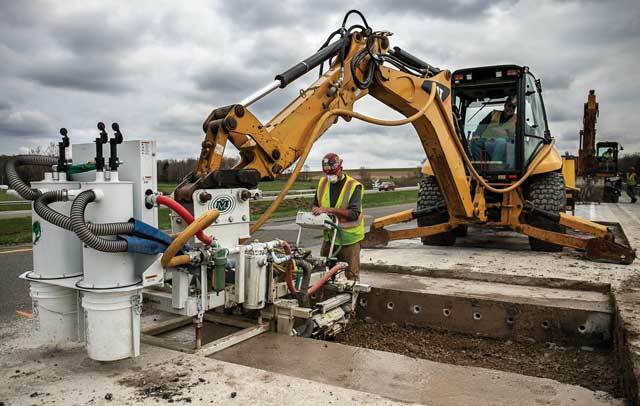 Besides offering the maneuverability to get jobs done faster, A3/A6 drills provide a safer alternative for operators, eliminating fatigue by using the carrier to transport the drill. Available side-shift functionality enables operators to drill a second set of holes without having to reposition the carrier. An optional dust collection system is available, meeting the requirements for dowel pin drills found in Table 1 of the Occupational Safety and Health Administration (OSHA) final respirable crystalline silica standard when used with an appropriate filter. For more information, visit minnich-mfg.com. Click this link for more on the latest in breaker attachments.